This burly offwidth is easily toproped and seldom led. 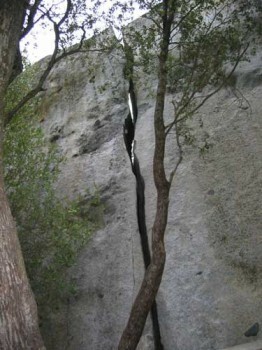 The crux comes just a few feet off the ground but the climbing remains physical and sustained to the top. Some advanced offwidth climbers use the "leavittation" technique but most climbers just throw in a knee, make a chicken wing, and struggle. Wear long sleeves and pants and you may want to tape your hands and ankles. Climb this route in cooler temperatures--even if it is near freezing the strenuous moves will keep you warm. Don't be discouraged if it takes you multiple visits to this climb to finally get it. Once you do, you?ll be ready to tackle most 5.10 and easier offwidths and squeeze chimneys in Yosemite. Which SuperTopo guidebooks include a topo for Generator Crack?